UPDATE: We are sold out for Monday 3/17 pickups. Please check back on Tuesday 3/18 for Wednesday 3/19 pickup availability! Woodpellets.com is opening phone lines for pellet pickup orders at Demer’s Garden Center in Manchester, NH today (Thursday, March 13th) at 9am. Prepayment is required, and customers must be able to pick up the order on Monday, March 17th. We are currently out of allocation for bag sales this week at Demers Garden Center – but should have new availability as early as Monday, March 17th. 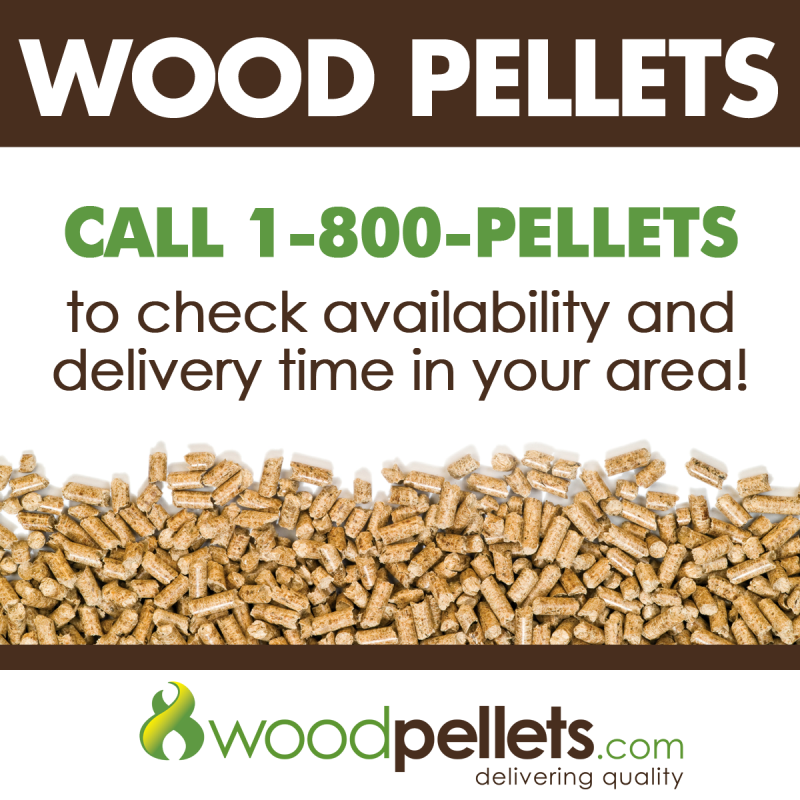 Check back with our WoodPellets.com site for the latest information – or give us a call at 1-800-PELLETS. We have customer service representatives available to answer your questions and concerns. Friday, March 14 UPDATE: Call us at 1-800-735-5387 on Tuesday the 18th to reserve bags for pickup on Wednesday, March 19th! Is It Too Late to Order Pellets This Winter? UPDATE: Lead times for delivery service has changed from up to three weeks, to within 7-10 days! Call us at 1-800-735-5387 to place your order now…it’s not too late! The pellets shortage of 2014 has made it nearly impossible to find pellets this March. And even if you live in a region served by our home delivery service, the lead time has now reached three weeks in many areas. But is it too late to order? No. What we have been telling customers is to “get in line” because nobody knows what might happen in the next couple weeks. If the shortage ends abruptly and you don’t need the fuel – simply cancel the order. We don’t require any prepayment. But if the winter continues even longer, or the shortage gets worse – you’ll be glad you secured your place in line. 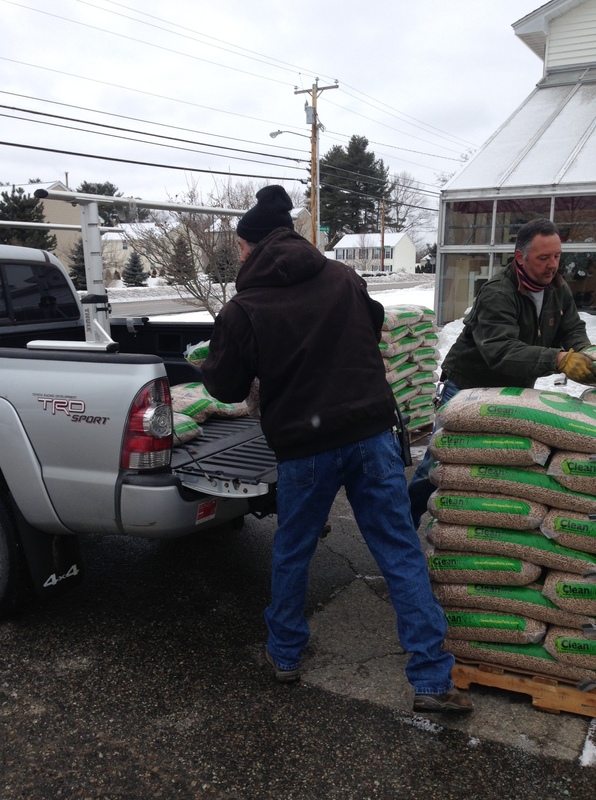 We are currently making available bags of wood pellets at our Manchester NH distribution center located at Demers Garden Center – 656 South Mammoth Road. There is a limit of 10 bags per customer per day. Call us at 1-800-PELLETS for more details. Our Flex Savings Plan allows you to make a monthly deposit in any amount you choose, enabling you to budget your wood pellet fuel purchase over many months – instead of a single large one-time payment. Sign up before March 21st – we’ll give you FREE Flex Delivery on your next order. Sign up must be completed by March 21st 2014. Free delivery is only good on orders of 3 tons or more. To qualify for free delivery you must have a minimum duration of at least 3 months. Free delivery is for “Flex Delivery” – Standard and Precision delivery will have a surcharge. Free delivery offer may not be combined with other offers or promotions. The wood pellet budget plan is available to everyone, so feel free to let your neighbors, friends, relatives, and colleagues know that this option is available to them. 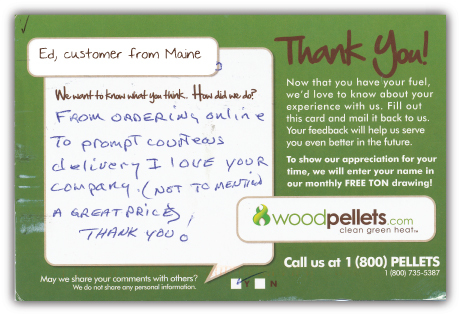 If they are new WoodPellets.com customers, make sure to have them mention your name when ordering and they will get $25 off their order and we’ll give you $25 off your next order with us (click here for more details on our Pellet Buck Program). The best part is that there’s no limit on the amount of credit you can earn! 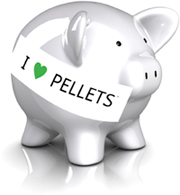 I saw a great article on DirectPellet.com regarding how to save money with home delivery. The bottom line is that picking up your pellets is expensive, dangerous, and a waste of time. Power House Premium Wood Pellets are made from 100% select hardwoods local to Pennsylvania. The 2012 test results for both ash and moisture content have been consistently strong, and we know this pellet will have a “bright” future in your stove! Buy Local! Easy Heat Wood Pellets are some of the best wood pellets available on the market today and are produced right here in Ohio. They have achieved a well-deserved reputation for solid heat output and consistency of both ash and moisture content. Less fiddling with your stove and more predictable heat output – what’s not to like about that! Trebio Softwood Pellets are a quality pellet that consistently exceed the premium wood pellet standards. The slightly darker color is a result of Trebio’s very thorough process of extracting moisture from the pellets. Excellent packaging, a consistent product, and the extra “boost” of heat output you’d expect from a softwood pellet. Have you burned these pellet brands before? What did you think? Share your thoughts with us in the comments below! State of NH makes it even easier to compare cost savings with wood pellets! Exciting news! The state of New Hampshire has added wood pellets to the list of fuels on its savings calculator, making it even easier to see just how much you’re saving with wood pellets instead of oil, propane, or other sources of heat. Just enter the current pricing of the fuels you want to compare, and voila! You have an instant calculation of cost per million BTU, letting you compare apples to apples and find out how much your heat actually costs. Questions, comments, observations? Sound off here! Questions about our delivery service? Get ’em answered here! Lead Delivery Coordinator Rick Caines works with our customers and our team of drivers to arrange prompt, convenient, and safe delivery. Al Valley is one of our most popular drivers! He works primarily in southern New Hampshire, and is known for his efficient service and expert touch with the pallet jack. RC: What I do is coordinate all the deliveries here at WoodPellets.com. Once you place your order, the orders come to me, and I set them up on runs for delivery. Typically, I prefer email…so I’ll send you an email about 48 hours ahead of time to let you know what day we’re going to come deliver. If I don’t get a response, I’ll follow that up with a phone call. Once I get confirmation, I set the runs up and forward everything to Al, and he goes out to make the delivery. I: About how long does it take, from the time I place my order to the time I hear from you? RC: It depends on the season. It could be anywhere from 3-7 days, or it could be a couple of weeks, just depending on what time of year it is when you place your order. I: So Al, once you have the delivery, what happens? AV: I have to go to the warehouse and pick up, get pellets for your pellet stove from the warehouse, make sure I got the right paperwork. Look at the delivery and make sure I ain’t gotta make any phone calls, to make sure when I deliver to your house that you’re leaving the instructions. Or if I have to call you in advance, to make sure that somebody’s gonna be there or not gonna be there. I: So I don’t have to be home when you deliver? AV: No, you do not. I: Ok, if I’m not home, what should I do? AV: We would like to have good instructions for where to put the pallets. I: Where do most people put their pallets? AV: In the driveway. Or in the garage. I: So you could put them in the back of my garage, for example? AV: Yes, we could. We have a pallet jack service that we do, that we can put the pallets in the back of the garage, or the side of the garage. And some people put them in the middle, ‘cause they usually have two car garages. I: Now what if I had a shed out back, or something like that. Could you do that? AV: We cannot with a pallet jack. It will not work on a wooden floor. It’s gotta be a cement floor. We could put the pallets maybe out by there with the Moffet, if it’s wide enough. A Moffett is approximately 9 feet wide, so we’ve gotta have clear room to maneuver it. I: Got it. So what happens if you go out for a delivery, do you ever have to reschedule? What happens if you have to reschedule? AV: Sometimes we have to reschedule because of weather, we could have mechanical errors on the truck or the machine. Most times, if we reschedule we can get it done in a short period of time. [to Rick] Right? I don’t know, you do it! RC: That was my question – you took my question! AV: Well you should’ve… you were supposed to jump in! I: Rick, do you have anything to add there? RC: Typically if we have to reschedule, we try to do so as quickly as possible. The following day, depending on what it is. If it’s weather related, we try to do it as quick as possible. But based on everybody’s needs and wants. I: So that’s the basic process. Do you guys have any advice or anything you recommend to customers to make sure everything goes really smoothly? RC: Good instructions are really important. Give us a good set of instructions or mark us out an easily accessible area. And give us a phone number that, if need be, we can call and someone will answer if there is an issue. So we don’t have to leave and not necessarily have the pellets where you want them and make you unhappy, I guess. AV: So we don’t have to reschedule you again. RC: Obviously It has happened, and yeah, we will come back if we don’t get it right the first time and we’ll move them for you. But we prefer not to have to do that. AV: the customer is very happy. I: Alright, thank you guys very much! I: Rick, we have a question from a customer. What happens if someone finds a broken bag in their delivery? RC: Well unfortunately, occasionally it does happen. If it happens and we know about it before we leave, the driver will call me, and we’ll issue you a credit instantly. If it happens, if the customer notices it, all they have to do is call myself or Joy, and Joy will give them a credit for any damaged bags. I: So, another question from a customer: can a customer leave their pellets outside? Is it ok to leave their pellets out in the rain? RC: It is. They come with a protective shroud over them, and as long as the shroud is intact and in place, it’s ok to leave them outside for several weeks. RC: Did you have anything to add, Al? AV: Well, what do you mean? What about putting the wrap around it? RC: And we recommend if you’re going to leave them outside for an extended period of time that you put a tarp over them, just to protect them. Do you have a delivery question for Al or Rick that they didn’t answer here? Post it below to continue the conversation! Ed got the best pellets at the best prices around!